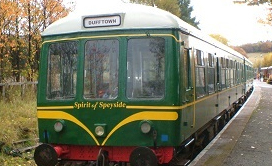 The Keith and Dufftown Railway is an eleven mile line linking the World’s Malt Whisky Capital, Dufftown, to the market town of Keith. This website gives full details of our services, timetables and special events, click the menu buttons above for further information. We hope you enjoy your electronic visit – do come to see us for real at Dufftown Station, Dufftown, Banffshire. Please note Keith has 2 stations, Scotrail Keith station and KDRA Keith Town station. KDRA Keith Town station is on the A96 close to the church and opposite the Factory Outlet Shop, watch out for our signs. PLEASE NOTE THE KDR DOES NOT ACCEPT BOOKINGS FOR OUR NORMAL SCHEDULED SERVICES UNLESS THERE ARE 10 OR MORE PEOPLE IN A GROUP IN WHICH CASE SEE FOOT OF EVENTS PAGE FOR GROUP BOOKINGS. Scheduled services for 2019 have begun and the railway is now open for the season. Well behaved dogs are welcome aboard our trains and are carried (free of charge) at the sole discretion of the guard. Cycles will also be carried free of charge, the guard has sole discretion as to how many and which cycles will be carried. All facilities at both Keith Town and Dufftown stations are wheelchair friendly. The Sidings Cafe at Dufftown is also wheelchair accessible. 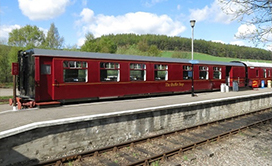 Unfortunately we cannot guarantee that the scheduled train will have wheelchair access, customers are requested to telephone 01340 821181 on the morning of their visit to confirm. 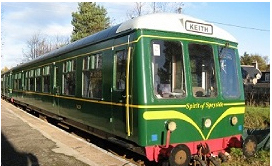 The Keith & Dufftown Railway Association is a company limited by guarantee. Registered Office: Dufftown Station, Dufftown, Banffshire. AB55 4BA Telephone: 01340 821181. Registered in Scotland: No. 157099. The KDRA is a member of the Heritage Railway Association. None of the material (text, images, graphics or code), or any part thereof, contained in this website may be reproduced in any form whatsoever without the expressed written permission of the holder of the copyright in that material. The Keith & Dufftown Railway Association does not necessarily sponsor, endorse or approve of any statements or information available in sites linked to from this website, nor do they accept responsibility for the content of those sites. The Keith & Dufftown Railway Association does not accept any liability which may arise from your use, misuse or reliance on the information contained in this website.